Anti-wrinkle Injection treatment is a well known technique for aesthetics and therapeutic purpose. It is an optimal, safe, magnificent treatment for various muscular conditions and in wrinkle reduction while improving the skin in a way that would look natural and pleasant. “The first impression is the last impression”, this well said quote signifies that skin reflects the behaviour and persona of an individual. Few people carry acne or some kind of scars that directly affect their personality. Also, some people get worried about the appearance of age signs on their skin. The Anti-wrinkle Injection treatment has been practised for many years to help people eliminate frown lines and tags. This treatment can preserve charming and young look without any anti-ageing cream. 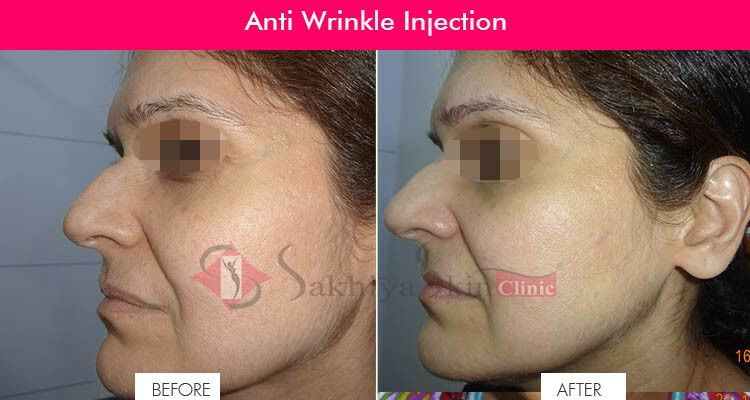 Find an apt Anti Wrinkles Treatment in Mumbai at Sakhiya Clinic. If these concerns worry you, you can go for an anti-wrinkle injection treatment. This cosmetic therapy uses a type of natural protein which is injected in a manner that treats definite muscular conditions not allowing them to contract and hence temporarily paralyzing them so that the wrinkle formation process gets ceased. As a result, the skin remains smooth and flawless. Anti-wrinkle injection treatment is the most widely accepted treatment suggested by cosmetic surgeons around the world so as to cure the acne scars or fine lines on the face and also to keep the muscle stiff and firm. It is the most effective option for reducing wrinkles and fine lines which have not quite set. This chemical is used in combination with saline and then is injected into the skin tissue. The anti-wrinkle injection requires very little recovery time like 24 -72 hrs to take the effect. Sometimes, the patients could get a mark at the place where it was injected, which may take up to two weeks to disappear. It takes around 7 days to notice the actual full observable results, but after two weeks the results will be clear and noticeable not only to you but also to everyone else out there. Thinning of the epidermis (surface layer of the skin). The loss of the elastic tissue (elastin) in the skin with age causes the skin to hang loosely. Flattening of the area where the epidermis and dermis come together. AM I A GOOD CANDIDATE FOR ANTI-WRINKLE INJECTION? Anti-Wrinkle Injection is best suited for patients [18-65 years] who do not want surgery, but desire reduction or elimination of wrinkles in certain areas. WHAT DOES THIS INJECTION CONSISTS OF? This is actually prescription medicine injected into the facial muscles to help temporarily improve the appearance of wrinkles, which are caused by repeated facial movements. The most commonly treated areas include: i. The lines near the corner of eyes known as crows feet caused by squinting or smiling. ii. Horizontal lines across the forehead caused by raising the eyebrow. iii. Glabellar lines between the eyebrows caused by frowning. CAN IT TREAT ALL KINDS OF WRINKLES? It treats dynamic wrinkles better than static wrinkles. It treats the forehead lines, crow’s feet [lines near the corner of the eye] frown lines[in between eyebrow], near the lip, top of the nose[bunny lines], neck bands. This injection can also be used for eyebrow shaping and gummy smile treatment. HOW DOES ANTI-WRINKLE INJECTION WORK? It works by simply blocking nerve impulses to the injected muscles, reducing the activities of the muscles underneath the skin to create a smooth and refreshed appearance. Generally, after the consultation, the entire procedure only takes up to 10 minutes. Since there is no downtime–you can have it during your lunchtime as well! WHEN ARE THE EFFECTS SEEN? Muscle paralysis develops over the week following injection, and maximal wrinkle reduction is seen up to one month after injection. The effects last up to five months, at which point muscle movement again returns to normal. HOW MANY TIMES CAN I HAVE IT INJECTED? There is no limit to the number of injections a patient can have over time. Injections need to be repeated 6monthly to retain the results. This is a very safe treatment. There may be some bruising which resolves quickly. Another potential risk is a weakness in surrounding muscles, created by the unwanted spread of this prescription medicine that is being injected, however, this can be easily resolved. With proper injection technique and a qualified dermatologist, the risk is eliminated. CAN I HAVE ANTI-WRINKLE INJECTION AND FILLERS DONE RIGHT BEFORE A BIG EVENT LIKE A VACATION OR REUNION? YES! The treatment allows immediate return to normal activities since bruising and swelling is minimal or nonexistent in some cases. Discomfort is usually minimal and brief. Prior to injection, your physician or nurse may choose to numb the area with a cold pack or anesthetic cream. The entire procedure takes approximately 10 minutes. We recommend you not to lie down or rub the injection area for 4 hours after treatment. This prevents the medicine from spreading. It is advisable to make facial gestures to help the medicine get into the treated muscles effectively.